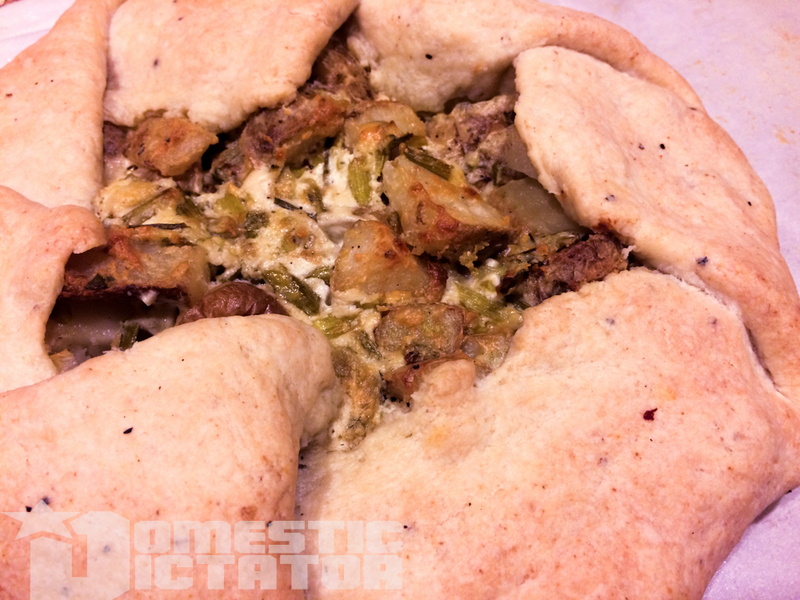 Half a recipe of Base Pie Crust with savory variations 1. Preheat oven to 375°. Form pie dough into a disk, wrap in parchment paper, and place in refrigerator. 400 grams mealy potatoes 2. Roughly chop potatoes - you're looking for approximately 1“ pieces. They don't need to look good, just be uniform. 8-12 stalks green onions 3. Remove wilted leaves from onions and slice away bulbs. Cut into 1” pieces and set aside. Crush garlic; set aside. 2 cloves garlic 4. Place a large skillet over medium high heat. Toss potatoes in olive oil, salt, and pepper. 1 tablespoon olive oil 5. Sauté potatoes for approximately 10 minutes, or until sides are slightly browned. Meanwhile, combine scallions, garlic, and goat cheese in a large bowl. 4 ounces goats cheese 7. While potatoes cook, remove dough from refrigerator and roll out on parchment paper. Get a good circle or around 12-14“ in diameter. 1 teaspoon salt 8. Add potatoes to onion and cheese mixture, combine. Pour into center of pastry and fold edges over, overlapping one another as you make your way around the edges. 1/2 teaspoon black pepper 9. Bake for 60 minutes. Check after 45 minutes that your crust has not start to turn too brown - if so, cover with foil.